Glasgow Film Festival has kicked off 2018 with some news that will excite film lovers all over Scotland and beyond. 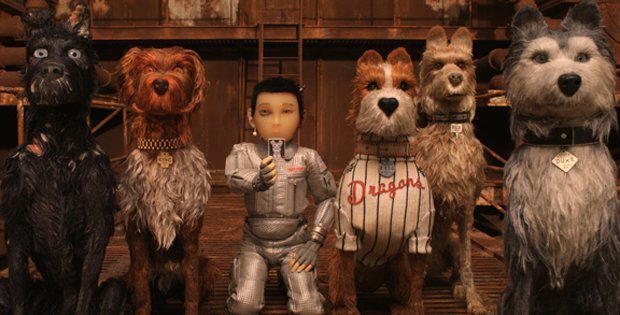 Returning to the city on 21 Feb, this year's festival is set to open with the UK premiere of Wes Anderson's latest flick Isle of Dogs, released in UK cinemas on 30 Mar. The animated adventure is set in a futuristic Japan and tells the story of Atari Kobayashi, 12-year-old ward to corrupt Mayor Kobayashi. When all the dogs of Megasaki City are quarantined to a vast garbage-dump, Atari sets off on an epic journey in search of his bodyguard-dog, Spots, making some canine friends along the way. The film sees Anderson go feature length with stop-motion animation again following on from his 2009 comedy Fantastic Mr. Fox, which starred George Clooney, Meryl Streep and Jason Schwartzman, among others. Stop-motion scenes have also cropped up The Life Aquatic and The Grand Budapest Hotel. Like all Anderson films, Isle of Dogs boasts an all-star cast, including Bryan Cranston, Koyu Rankin, Edward Norton, Bill Murray, Jeff Goldblum, Scarlett Johansson, Ken Watanabe and many more. Along with the Opening Gala, other confirmed events include the School Disco, which involves simultaneous screenings of Gregory's Girl and Clueless, followed by an 80s v 90s disco. Elsewhere on the programme, there's a focus on new Irish cinema, a night of The Big Lebowski and bowling, a live performance from Oscar-nominated composer Mica Levi as part of The Unfilmables and an appearance from SAY Award winners Sacred Paws, who will provide a live soundtrack to Margaret Salmon's documentary Mm. The full programme for Glasgow Film Festival will be announced on Wed 24 Jan. Tickets for the Opening Gala go on sale at 10am on Mon 8 Jan at glasgowfilm.org/festival. When the corrupt Mayor of Megasaki City sends all the dogs to Trash Island, his 12-year-old ward Atari (Rankin) goes there to find out what happened to his beloved Spots (Schreiber). Sensationally rendered stop-motion tribute to Japanese cinema, rich in detail and full of deadpan heroism and epic ineptitude. Delightful.